Every year is the year of Margaret Atwood, but she’s really hitting it out of the proverbial park in 2017. The Hulu adaptation of her 1985 novel The Handmaid’s Tale swept the 2017 Emmys, and now her historical fiction novel Alias Grace has been adapted for Netflix. Oh, and the 77-year-old author appeared in both of these. No biggie. 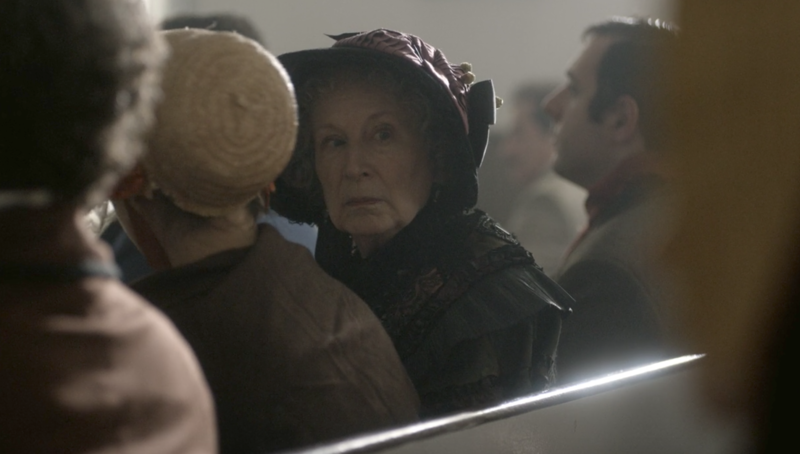 Margaret Atwood had a cameo in Alias Grace, but it’s blink-and-you’ll-miss-it. The author has appeared in adaptations of her work before. She recently played an aunt who hits Offred in The Handmaid’s Tale. However, her role in Alias Grace is more pronounced. In fact, she even has dialogue — and an ingenious character name. "In the fourth episode of the miniseries, Grace accompanies the man she works for, Thomas Kinnear, and his housekeeper Nancy Montgomery to church, where it’s obvious (to everyone except Grace) that Thomas and Nancy are having an affair," Entertainment Weekly details. "'It’s an outrage,' Atwood’s bonnet-wearing character says, gesturing her head back toward Thomas and Nancy. 'An outrage.'" Yes, that’s correct: Margaret Atwood’s Alias Grace cameo involves both dialogue and a bonnet. How wonderful. According to the series’ director, Atwood was amused by her character’s name. Atwood’s official role was “Difficult Woman,” and director Mary Harron told HuffPost that Atwood herself enjoyed it quite a bit. Literally, she is not only the most delightful person in Canada, but also on Earth. And any parallel Earths we may discover in the near future. Even Atwood’s costars, like series star Sara Gadon, agree that she is de-lightful. In order to prepare for her role, Gadon joked during a Netflix press event that to prepare for the role, she, “went to Margaret’s house every day and I washed her feet.” If given the chance to be up close and person with the author, we’d probably do the same. Gadon continues, almost a little starstruck (and also, same). "You grow up reading Margaret in school. I've read a lot of her more science fiction stuff, but I've always been really drawn to that kind of writing, the more subjective female experience. When I read Alias Grace...I thought oh, I'll just pick this up and try and read a little bit before my meeting, and I just tore through the whole novel, because she gets inside of people's head in a way that makes you feel so close to them. Her story really haunted me, and it still haunts me, and it's something that I still think about. I think that's the beauty of her writing." In short, Margaret Atwood remains a fave, and we are grateful for her. Alias Grace stars Anna Paquin, Zachary Levi, and director David Cronenberg. It’s now streaming now on Netflix, so feel free to GIF the author’s cameo as many times as feels right. Additional reporting by Rachel Paige.